Tissue homing of activated T cells is typically mediated through their specific integrin and chemokine receptor repertoire. Activation of human primary CD4+ T cells in the presence of CD46 cross-linking induces the development of a distinct immunomodulatory T cell population characterized by high IL-10/granzyme B production. How these regulatory T cells (Tregs) migrate/home to specific tissue sites is not understood. In this study, we determined the adhesion protein and chemokine receptor expression pattern on human CD3/CD46-activated peripheral blood CD4+ T cells. CD3/CD46-activated, but not CD3/CD28-activated, T cells up-regulate the integrin α4β7. The interaction of α4β7 with its ligand mucosal addressin cell adhesion molecule 1 (MAdCAM-1) mediates homing or retention of T cells to the intestine. CD3/CD46-activated Tregs adhere to/roll on MAdCAM-1-expressing HeLa cells, similar to T cells isolated from the human lamina propria (LP). This interaction is inhibited by silencing MAdCAM-1 expression in HeLa cells or by the addition of blocking Abs to β7. CD46 activation of T cells also induced the expression of the surface-bound cytokine LIGHT and the chemokine receptor CCR9, both marker constitutively expressed by gut LP-resident T cells. In addition, we found that ∼10% of the CD4+ T lymphocytes isolated from the LP of patients undergoing bariatric surgery contain T cells that spontaneously secrete a cytokine pattern consistent with that from CD46-activated T cells. These data suggest that CD46-induced Tregs might play a role in intestinal immune homeostasis where they could dampen unwanted effector T cell responses through local IL-10/granzyme B production. An essential property of the immune system is its ability to prevent/clear dangerous infections while remaining unresponsive to Ags derived from innocuous substances or host tissue. Such immunological tolerance is mediated through thymic clonal deletion and peripheral anergy induction (1). Recently, active suppression through regulatory T cells (Tregs)3 has re-emerged as a major mechanism in the control of autoreactive or unwanted T cells responses (2, 3, 4). Tregs are currently divided into two major subpopulations: natural thymic-derived CD4+CD25+ Tregs, and adaptive, or peripherally induced, Tr1 and Th3 cells (2, 5). Natural Tregs constitute ∼10% of peripheral blood CD4+ T lymphocytes and express the transcription factor Foxp3 and high levels of the IL-2R α-chain (CD25). They require exogenous IL-2 for their activation/function, are specific for self-Ags, and act via a contact-dependent mechanism (2, 5). Natural Foxp3+ Tregs are thymus derived but can also be induced in the periphery via conversion of Foxp3− cells through the action of TGF-β (6, 7). In contrast, adaptive Tr1 and Th3 cells are not thymus derived but generated in the periphery against both self-Ags and foreign Ags. They also require exogenous IL-2 for their expansion but mediate their suppressive effect by secretion of immunosuppressive cytokines (2, 8). Foxp3 expression is not a prerequisite for the function of adaptive Tregs (9, 10, 11). Although Th3 cells secrete TGF-β and are critical for the induction of oral tolerance (12, 13), Tr1 cells are characterized by high-level synthesis of IL-10 and play a role in the maintenance of tolerance against enteric bacteria (8, 14). Recent evidence suggests the existence of additional adaptive human Treg types that display features distinct from those of Tr1 and Th3 cells (15). CD46, a widely expressed complement inhibitor, can function as a costimulatory molecule in the activation of human peripheral CD4+ T cells (16, 17). Cross-linking of CD46 with Abs or one of its natural ligands (e.g., C3b dimers or streptococcal M protein) in the presence of TCR stimulation leads to the development of highly proliferative cells with a regulatory phenotype that most closely resembles Tr1 cells (17, 18, 19). CD3/CD46-induced Tregs synthesize large amounts of IL-10, but low or undetectable quantities of IL-2, IL-4, and IL-5. Like natural CD4+CD25+ Tregs, their induction/function is IL-2 dependent; however, they do not require basal Foxp3 expression (17, 19, 20). They suppress bystander T cell activation in an IL-10-dependent, contact-independent manner. Interestingly, these CD46-induced Tr1-like cells also demonstrate strong granzyme B and perforin expression and display contact-dependent cytotoxicity toward autologous T cells, including activated CD4+ and CD8+ T cells (20, 21). Thus, CD4+ T cells activated via CD46 stimulation possess three distinct mechanisms for T cell suppression: secretion of IL-10, consumption of IL-2, and granzyme B-mediated contact-dependent inhibition (19). Although the exact in vivo roles of adaptive Tregs are not understood, they seem to play an important part in the homeostasis of intestinal immunity, as mice deficient in the II10 or II2 gene succumb to colitis (22, 23). Furthermore, the absence of adaptive IL-10-producing Tregs leads to intestinal inflammation due to a pathological immune response induced by commensal bacteria in the gastrointestinal tract (24, 25, 26, 27). The ability of Tregs to modulate immune responses has also been established in animal models of autoimmunity, including inflammatory bowel disease (IBD) (26, 27). In addition, a recent study comparing the possible distinct functions of Foxp3-positive and IL-10-secreting Tregs in the maintenance of tolerance suggests a dominant role for IL-10-producing Tregs at the host/environmental mucosal interfaces including the gut, lung, and skin (28). For CD4+ T cells to home to the intestine, the expression of specific adhesion proteins and chemokine/cytokine receptors on their surface is essential (29, 30, 31). T cells residing in the lamina propria (LP) of the small intestine express the gut-specific α4β7 integrin (CD49d/β7) (32), the chemokine receptor CCR9 (33), and the surface-bound cytokine a cellular ligand for herpes virus entry mediator and lymphotoxin receptor (LIGHT; TNFS14), a member of the TNF superfamily (34, 35). The principal α4β7 ligand is mucosal addressin cell adhesion molecule 1 (MAdCAM-1) (31). MAdCAM-1 is expressed by intestinal endothelial cells and gut LP venules and this interaction mediates recruitment of effector T cells/Tregs into the small and large bowel (30). The interaction of CCR9 on T cells with its ligand CCL25 (thymus-expressed chemokine), is required for optimal T cell entry into the small intestinal LP (36, 37). Recently, LIGHT was discovered being constitutively expressed by human LP-resident CD4+ T cells and its deregulation might contribute to intestinal inflammation (35). Because CD46 activation of naive primary human CD4+ T cells equips these cells with properties similar to adaptive IL-10-producing Tregs that are preferentially found in mucosal tissue, we analyzed herein the homing properties of complement-induced Tregs. We found that CD46 stimulation induces the up-regulation of the gut-homing specific integrin α4β7. The expression of this adhesion molecule allows CD46-induced Tregs to roll onto/adhere to MAdCAM-1-expressing epithelial cells under physiological flow conditions. In addition, CD46 stimulation of T cells induces LIGHT expression and, in the presence of retinoic acid (RA), the specific up-regulation of CCR9. Finally, we identified a population of T cells in the human small intestinal LP with characteristics of CD46/complement-activated T lymphocytes. Taken together, these results suggest that CD46-activated T cells could home to the intestine through up-regulation of integrin α4β7, where they would suppress unwanted effector T cell responses through IL-10 secretion. Normal small intestinal tissue samples (jejunum) were obtained from patients undergoing bariatric surgery. Blood was drawn from healthy volunteers. Patients and donors provided written consent in accordance with the Declaration of Helsinki. Tissue and blood were collected and processed with the approval and in accordance with the Washington University Medical Center Human Studies Committee guidelines. Cell lines, media, buffer, and supplements were obtained from the tissue culture facility at Washington University School of Medicine (St. Louis, MO) if not stated otherwise. PBL and LP-resident lymphocytes (LPL) were maintained in RPMI 1640 medium (Life Technologies) with 10% FCS and 200 mM l-glutamine in the presence of 25 U/ml recombinant human IL-2 (BioSource International). HeLa cells were cultured in DMEM with 10% FCS and l-glutamine. The mAb to CD46, TRA-2–10, was generated in house. The mAbs to human CD3 and CD28 and the function neutralizing mAb to β7 (FIB504) were purchased from BD Pharmingen. The mouse nonspecific isotype-matched control mAb (MOPC 31c, IgG1) was obtained from Sigma-Aldrich. The mAb to MAdCAM-1 (17F5) was purchased from Abcam. mAbs to human CD3 (HIT3a), CD4, CD25, CD18 (β2), CD29, CD45RA and CD45RO, CD49d/α4 (9F10), CD103, CD154/CD40L (TNF-related activation protein 1), CLA, β7 (FIB504), IL-10 (JES3-9D7), and GM-CSF (BVD2-21C11) labeled with FITC, PE, allophycocyanin, or PerCP were used for FACS analyses and obtained from BD Biosciences. Fluorochrome-labeled mAbs to CCR4, CCR9, and TNFS14/LIGHT were obtained from R&D Systems. CD4+ T lymphocytes were purified from whole blood as previously described using Ficoll separation and human CD4 microbeads (Miltenyi Biotec) (17). In vitro stimulation of isolated CD4+ T cells was performed in 96-well culture plates coated with mAbs to CD3 and CD28, CD46, or a matched IgG1 isotype control Ab, each at 2 μg/ml. Purified CD4+ lymphocytes (1.5–0-2.0 × 105 cells/well) were added in 100 μl of culture medium supplemented with 25 U/ml recombinant human IL-2 and in some cases with 10 nM all-trans-RA (Sigma-Aldrich). The plates were centrifuged at 250 × g for 1 min, cultured, and T cells or cell supernatants were harvested at desired time points. All intestinal tissue samples were processed within 4 h after surgical removal. The mucosa was dissected, weighted, cut into 2- to 4-mm2 pieces and washed three times in a sterile bottle with a magnetic stirrer for 5 min in 50 ml of Media I (HBSS) without Ca2+ and Mg2+ containing Fungizone, Tircacillin, Amikacin, trimethoprim, and Sulfamethoxazole (Sigma-Aldrich). Mucosal tissue was washed repeatedly with Media II (HBSS without Ca2+ and Mg2+ containing Fungizone, antibiotics, 500 mM EDTA (Sigma-Aldrich), and 5% human serum) until all crypts/individual epithelial cells were removed. Cells were washed three times with Media I followed by two times with HBSS with Ca2+ and Mg2+. The mucosa was then digested on a Thermolyne Nuova II hot plate/stirrer at 800–1000 rpm for 6–8 h at 37°C in 5% CO2 in Media III (HBSS with Ca2+ and Mg2+, Fungizone, antibiotics, 10% pooled human serum, and 300 U/ml collagenase; Sigma-Aldrich). Supernatants were collected after digestion and remaining tissue was washed twice with Media II. Supernatants and washes were combined, layered over Ficoll-Hypaque (Pharmacia Biotechnology), and centrifuged for 40 min at 400 × g. The interface was collected, washed once with HBSS with EDTA, resuspended in 15 ml of density gradient-forming Percoll (Sigma-Aldrich) solution (90% Percoll-9 parts Percoll and 1 part 10× PBS-diluted 1/2 with 1× PBS) and centrifuged for 15 min at 400 × g. The cell pellet containing the LP lymphocytes was washed twice in PBS containing 15% FCS and 1.5 mM EDTA. CD4+ LPL were then isolated using human CD4 microbeads (Miltenyi Biotec). LPL were cultured at 1.5 × 106/ml in medium supplemented with 25 U/ml recombinant human IL-2. Purity of isolated PBL and LPL was consistently >95% and viability was >93%. HeLa cells were grown in 10-cm diameter plates (1 × 106 cells/plate) overnight in antibiotic-free medium to ∼50% confluence. Cells were then transfected with either 15 nM small interfering RNA (siRNA) targeting MAdCAM-1 (sc-43037; Santa Cruz Biotechnology) or 15 nM negative control scramble siRNA (sc-37007; Santa Cruz Biotechnology) plus 2.5 nM Cy3-labeled negative control siRNA (AM4621; Ambion) using Lipofectamine 2000 (Invitrogen) and cultured. Fresh antibiotic-free medium was added after 6 h. For flow experiments, cells were subcultured onto glass slides and for conjugate formation experiments into 24-well plates 24 h after transfection. Cells were used for flow/conjugate experiments 48 h after transfection. siRNA transfection efficiency and protein knockdown were monitored via FACS analysis using the Cy3-tagged siRNA and MAd-CAM-1 Ab, respectively. HeLa were grown to confluence in 24-well plates and CFSE-labeled PBL (3 days) were added to HeLa cells in a 1:1 cell ratio (2.5 × 105 cells/well). The cell mixtures were incubated for 1 h at 37°C and 5% CO2 without agitation. Nonattached cells were then aspirated and the plates were washed three times with PBS. Remaining cells were detached from the wells by incubation with medium containing 5% trypsin for 15 min and then subjected to FACS analysis to assess the amount of retained PBL and HeLa/PBL conjugates. To assess for the specificity of the α4β7-MAdCAM-1 interaction, 10 μg/ml blocking mAb to β7 was added to a proportion of samples during the T cell and HeLa incubation. Freshly isolated LPL were used as positive control and nonactivated PBL as negative control. HeLa cells were seeded onto glass microscope slides (1× 3 inches; Fisher Scientific) and grown to confluence. After removing nonadherent HeLa cells, the parallel plate flow chamber (GlycoTech) was constructed by first placing a 0.0254- cm-thick silicone gasket on the surface of a polycarbonate flow deck and then attaching the microscope slide to the flow deck using a house vacuum. Medium was placed in the flow channel before attaching the HeLa-containing microscope slide to maintain cell viability. CSFE-labeled T cells were injected into the flow chamber (1 × 106 cells) and allowed to adhere to the HeLa monolayer for 15 min at 37°C under static conditions. Fluid flow was initiated at a flow rate of 0.4 ml/min using a peristaltic pump and was increased by 0.4 ml/min at 1-min intervals during the course of the experiment. A pulse dampener (Cole Parmer) was used in the flow loop between the pump and the parallel plate flow chamber to eliminate pulsatile flow due to the pump. The wall shear stress, τw, as experienced by the cell monolayer was calculated by: τw = 6μQ/a2b, where μ is the apparent viscosity of the cell medium (water at 37°C = 0.0076 Pa), Q is the volumetric flow rate (ml/s), a is the flow channel height (0.0254 cm), and b is the flow channel width (1.0 cm). 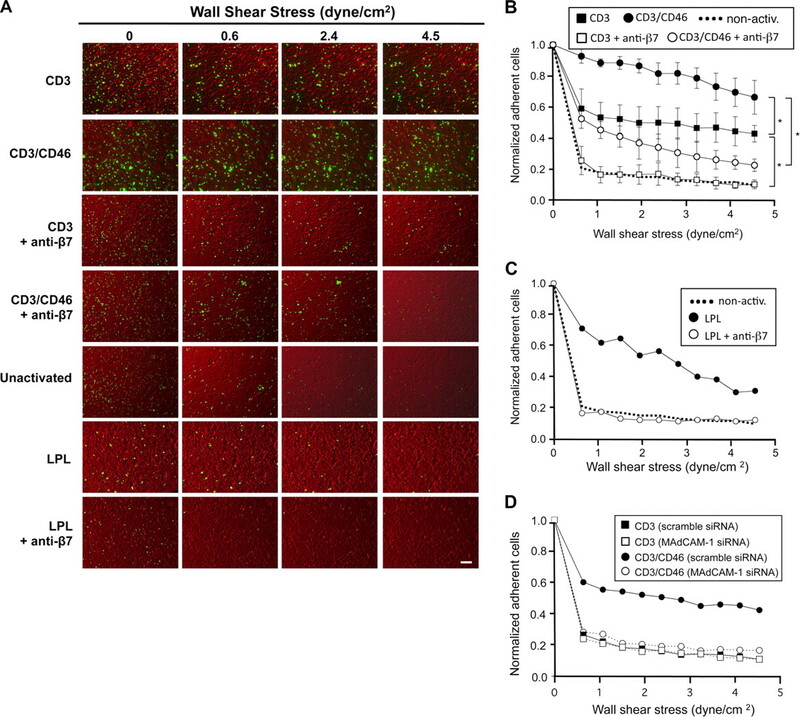 Experiments were conducted in a constant temperature chamber (37°C) and time-lapse microscopy (Δt = 5 s) was used to determine the number of adherent T cells at each wall shear stress level. Differential interference contrast (DIC) and fluorescent images were captured using a ×10 objective on a Olympus IX71 inverted microscope. For analysis, CSFE-labeled T cells were counted using MetaMorph software (Molecular Devices) before the onset of flow (t = 0 min) and then again after 1 min at each flow rate using the images captured (DIC and fluorescent) just before the flow rate was increased. For applicable conditions, T cells were incubated with anti-β7 Ab for 30 min before injection into the flow chamber. Cytokine secretion of T cells was measured using the appropriate EASIA kits from BioSource International. For intracellular cytokine staining, T cells were cultures for 24 h with the addition of monensin (BD Biosciences) for the last 12 h of culture. Experiments were performed at least three times using a different donor each time. All activation conditions were performed in triplicate if not stated otherwise. Interdonor variability for cytokine secretion ranged from 10 to 35%. Statistical significance was determined using the paired Student’s t test or by ANOVA using the Student-Newman-Keuls post hoc test. A value of p < 0.05 was considered to be significant. Cross-linking of the complement regulator CD46 and the TCR on human peripheral blood CD4+ T cells (PBL) induces the development of a distinct T cell subset with features resembling most closely Tr1 Tregs (17). These complement-induced immunomodulatory cells suppress activation of bystander T cells through the production of IL-10 and granzyme B (17, 20, 21). However, the in vivo role of CD46-activated T cells is unclear. Because other adaptive IL-10-producing Treg subpopulations are thought to play a role in intestinal immunity, we determined whether CD3/CD46 activation of peripheral CD4+ T cells imprints these cells with gut-homing properties. Purified CD4+ PBL were activated with Abs to CD3 and CD46 cells FACS analyzed for their cell surface adhesion protein and chemokine receptor expression pattern, in comparison to T cells isolated from the LPL. We also included in all experiments CD3/CD28/CD46-activated cells to monitor for the impact of simultaneous CD28 and CD46 activation of CD4+ T cells. The CD4+ LPL used in this study were isolated from samples of small intestinal tissue obtained from normal donors undergoing bariatric surgery. The surface marker expression analysis of these cells showed normal CD46 protein levels and the expected expression of activated helper/inducer T cell marker as has been shown for T cells residing at this location (38) (data not shown). Fig. 1⇓A shows a representative FACS analysis of the purity and viability of the isolated CD4+ T cell populations. Although most PBL express α4 and β7, these heterodimers are usually in an inactive conformation and resume their functional conformation only when paired in a specific expression profile on the surface upon cell stimulation (31, 39, 40). We found that CD3/CD46- and CD3/CD28/CD46-activated T cells change their expression profile of the α4 and β7 integrins to an expression pattern similar to that found on LPL: At day 3 after activation almost all CD3/CD46- or CD3/CD28/CD46-activated T cells showed an α4 and β7 expression profile similar to that found on LPL (Fig. 1⇓, B and C). In contrast, nonactivated or CD3- and CD3/CD28-activated T cells did not show an increase in the LPL-specific α4β7 expression profile (Fig. 1⇓, B and C). The presence of low-level α4β7 expression in the functional LPL conformation on a proportion of PBL (Fig. 1⇓, B and C) is in accordance with previous studies (30, 40); however, the physiological significance of this basal integrin expression is not clear. CD3/CD46-activated T cells express α4β7, LIGHT, and CCR9. Purified peripheral blood CD4+ T cells (PBL) were activated with the indicated immobilized mAbs, and cell samples were analyzed after 48 and 72 h via FACS for the expression of α4β7, LIGHT, and CCR9. For the expression analysis of CCR9, cells were incubated in medium containing 10 nM all-trans-RA. Freshly isolated nonactivated LPL were used as positive control in all experiments. A, One representative FACS analysis depicting the purity and viability of the isolated PBL and LPL CD4+ subpopulations. B, Single-stain analysis of α4, β7, LIGHT, and CCR9 expression at 72 h after activation and double-stain analysis for α4 and β7 (C) or LIGHT and CCR9 (D) expression of PBL and LPL 72 h after activation/isolation. Shown is one representative FACS analysis of three similarly performed experiments for each double staining. E–G, Statistical analysis of three similarly performed experiments. Data shown represent integrin/LIGHT/CCR9 expression (mean ± SD) of three separate experiments. Statistical difference in α4β7, LIGHT, and CCR9 expression between analyzed lymphocyte subpopulations was determined using the paired Student t test with ∗, p < 0.05; ∗∗, p < 0.01; and ∗∗∗, p < 0.005. Small intestine resident T cells also constitutively express the chemokine receptor CCR9 (31, 41) and the surface-bound cytokine LIGHT (34, 35). When we analyzed CD3/CD46- and CD3/CD28/CD46-activated PBL for the expression of these two additional LPL markers, we found that these cells also up-regulate both LIGHT and CCR9 (Fig. 1⇑B). More than 50% (±9%) of CD3/CD46- and CD3/CD28/CD46-activated T cells express LIGHT at levels comparable to those found on LPL at day 3 (Fig. 1⇑B). In addition, PBL activation with CD3/CD46 induced significantly higher CCR9 expression (60 ± 7%) as compared with CD3 (5 ± 30%) or CD3/CD28-activated PBL (30 ± 6%). CD3/CD28/CD46 activation of PBL increased LIGHT expression only marginally when compared with CD3/CD46 activation (Fig. 1⇑B) but increased CCR9 expression from ∼60% to >80% (±4%; Fig. 1⇑B). However, the induction of CCR9 expression was dependent on the presence of the vitamin A (retinol) metabolite RA in all activation conditions (Fig. 1⇑B). This observation is in accordance with a study showing that RA enhances CCR9 (and α4β7) expression on activated T cells and imprints these cells with gut tropism (39). Fig. 1⇑D shows a representative FACS analysis for the concurrent expression of LIGHT and CCR9 of LPL and the differently activated PBL. These data demonstrate that ∼50% of the CD3/CD46 or CD4/CD28/CD46-activated PBL express all three of the analyzed gut-specific T cell markers, since all LIGHT/CCR9-positive PBL expressed also the LPL-specific α4β7 pattern (data not shown). None of the CD3- or CD3/CD28-activated T cells show simultaneous expression of the LPL marker. Fig. 1⇑, E–G, shows the statistical analysis of α4β7, LIGHT, and CCR9 expression on activated PBL of three similarly performed experiments (100% corresponds to the expression of these markers on LPL). We also analyzed CD3/CD46-activated T cells for the expression of additional integrin/adhesion molecules, which could mediate T cell homing or retention to other mucosal sites, inflamed tissue, or lymph nodes. CD3/CD46 or CD3/CD28/CD46 cross-linking on PBL did not induce αEβ7 (CD103/β7) expression, which is present on small intestinal intraepithelial lymphocytes and mediates their retention at this location (30, 31, 32) (Fig. 2⇓). In addition, none of the analyzed activation conditions induced the cutaneous lymphocyte Ag (CLA) or the β1 (CD29) integrin, which are required for skin homing (31) (Fig. 2⇓). Moreover, we observed that CD46 signaling seems to suppress the CD3-induced up-regulation of the skin-homing chemokine receptor CCR4 (31). Interestingly, the concurrent activation of T cells with both costimulators, CD28 and CD46, overrides the down-regulatory effect of CD46 on CCR4 expression (Fig. 2⇓). No induction of CCR5, a chemokine receptor that directs cells to inflamed tissues, or of CCR7, which is essential in the shuttle of T cells through lymph nodes, was observed under any of the analyzed activation conditions (31) (data not shown). The integrin β2 (CD18) mediates cell-cell interactions and is expressed in a high amount by skin and possibly lung resident T cells (31). 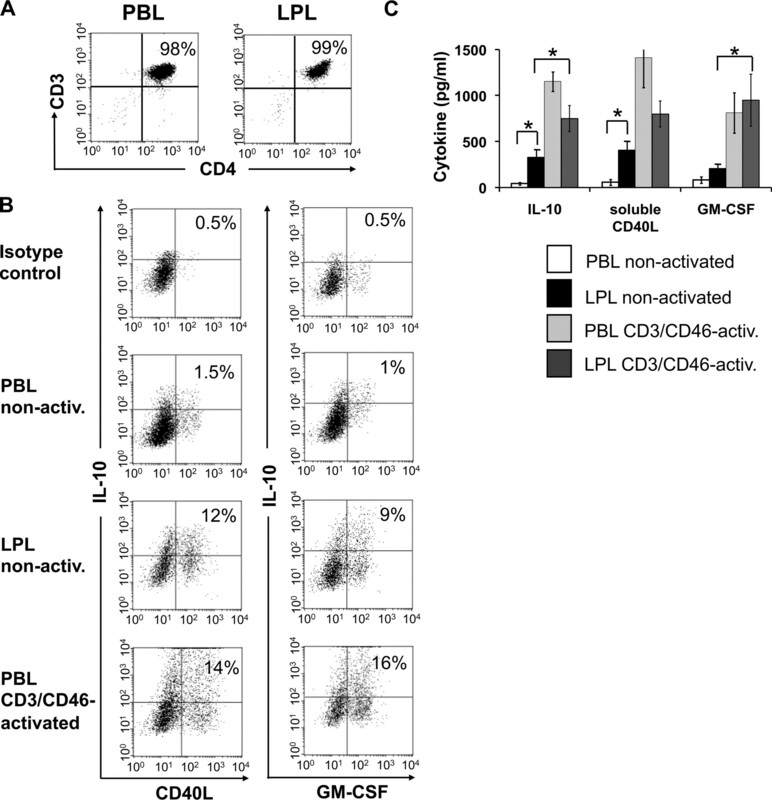 CD3 activation of PBL induces β2 on PBL and its expression is increased upon CD46 engagement to the levels found on LPL (Fig. 2⇓). The significance of β2 expression on LPL is unknown. Analysis of the expression profile of additional selected homing markers on CD3/CD46-activated CD4+ PBL. CD4+ T lymphocytes were isolated and then activated as indicated for 72 h. The expression of the shown homing marker/integrins was assessed via FACS. Freshly isolated nonactivated LPL were used as positive control and nonactivated PBL as negative control. Shown is the representative result of three similarly performed experiments. These data demonstrate that the concurrent engagement of CD46 during TCR-mediated activation of primary human CD4+ T cells in vitro induces the expression of an adhesion molecule and chemokine/cytokine receptor pattern characteristic of small intestinal LP T cells. We next assessed whether the CD3/CD46-induced expression of α4β7 has physiological consequences. We asked whether the α4β7 up-regulation enables these cells to interact with cells expressing this integrin’s ligand, MAdCAM-1 (30, 32). To do so, we used the human cervical epithelial HeLa cell line, which expresses MAdCAM-1, and HeLa cells in which MAd-CAM-1 expression was abrogated via RNA silencing using siRNA targeting MAd-CAM-1 (Fig. 3⇓, A and B). Purified CFSE-labeled PBL, nonactivated or CD3-, CD3/CD28-, CD3/CD46-, or CD3/CD28/CD46-activated cells (Fig. 3⇓C) were incubated with HeLa cells that had been transfected with either scramble (control) siRNA or MAd-CAM-1 siRNA in tissue culture plates. Primary human LPL served as a positive control in this assay. Nonattached T cells were removed through thorough washing and the percentage of T cells that remained bound to the HeLa cells and formed conjugates was measured by FACS. CD3/CD46-activated, α4β7-expressing T cells form conjugates with MAdCAM-1-expressing HeLa cells but not with HeLa cells in which MAd-CAM-1 expression had been silenced. A, siRNA transfection efficiency of HeLa cells. HeLa cells were transfected with either Cy3-labeled siRNA targeting MAdCAM-1, negative control scramble siRNA, or buffer (mock, shaded histogram) and transfection efficiency was determined via FACS 24 h after transfection. B, Analysis of MAdCAM-1 protein expression/knockdown after siRNA transfection. HeLa cells were transfected with the indicated siRNAs and MAd-CAM-1 expression was analyzed 24 h later via FACS. The shaded histogram shows staining with an isotype control Ab. C and D, CD3/CD46-activated CD4+ PBL form increased numbers of conjugates with MAdCAM-1-expressing HeLa cells. HeLa cells were transfected with Cy3-labeled control scramble siRNA or MAdCAM-1 siRNA grown to confluence in culture plates and incubated with CFSE-labeled PBL that had been activated for 72 h under the depicted activation conditions. Nonattached cells were removed, remaining cells detached, and analyzed by FACS analysis for the amount of retained PBL and HeLa/PBL conjugates. Freshly isolated LPL were used as positive control and nonactivated PBL as negative control. Shown is one representative FACS analysis of three similarly performed experiments. E, Statistical analysis of three separate experiments performed as described in C (mean ± SD). F, The addition of an anti-β7 Ab decreases binding of CD3/CD46-activated PBL and LPL to HeLa cells. Experiments were performed as described in C using the control siRNA-transfected HeLa cells but with the addition of a blocking anti-β7 Ab. Shown is the statistical analysis of β7-mediated blocking of the PBL or LPL-HeLa interaction of three separate experiments (mean ± SD). Statistical differences in E and F were determined using the paired Student t test with ∗, p < 0.05 and ∗∗, p < 0.01. Fig. 3⇑D shows representative FACS results obtained during the T cell/HeLa adhesion/conjugate formation assays. Fig. 3⇑E summarizes the statistical analysis of three separately performed experiments for each. CD3/CD46- and CD3/CD28/CD46-activated PBL and LPL specifically adhered to HeLa cells expressing MAd-CAM-1: These T cell populations formed comparable levels of conjugates with MAd-CAM-1-positive HeLa cells (Fig. 3⇑D, upper right quadrants) while significantly reduced (up to 85% reduced) conjugate formation was observed when MAd-CAM-1 expression was silenced in these cells (Fig. 3⇑, D and E). Additionally, a high number of nonconjugated LPL, CD3/CD46- activated, and CD3/CD28/CD46-activated T cells are retained on culture plates containing HeLa cells expressing MAd-CAM-1 (Fig. 3⇑D, upper left quadrant) but not on HeLa cells lacking MAd-CAM-1 expression (Fig. 3⇑D). These cells most likely represent T cells that bound specifically, but more weakly, to HeLa cells, such that the cells were not detached during washing but because of their less strong binding to HeLa cells, these conjugates were disrupted during the FACS analysis. In contrast to the LPL and CD46-activated T cell populations, only 4% (±23%) of nonactivated, 5% (±10%) of CD3-activated, and 12% (±15%) of CD3/CD28-activated PBL bound to MAd-CAM-1-expressing HeLa cells (Fig. 3⇑, D and E). The low, but statistically significant, binding of these T cell populations to HeLa cells is not surprising since a small proportion of these cells express low levels of α4β7 in the active conformation (Fig. 1⇑, B, C, and E). As expected, none of these activation conditions induced a significant interaction with the control HeLa cells (Fig. 3⇑, D and E). We also performed the above-described experiments using another cell line, 293T cells, which does not express MAd-CAM-1. As expected, neither the LPL control cells nor the CD3/CD46- or CD3/CD28/CD46-activated PBL displayed binding to 293T cells (data not shown). We next determined whether the binding of CD46-induced Tregs to HeLa cell is indeed mediated through the α4β7-MAdCAM-1 interaction. We repeated the adhesion/conjugate formation assays in the presence of a blocking mAb to β7. The addition of this mAb reduced conjugate formation between LPL and HeLa cells and CD3/CD46- and CD3/CD28/CD46-activated PBL and HeLa cells by 30–50%, but had no statistically significant effect on nonactivated, CD3, or CD3/CD28-activated PBL (Fig. 3⇑F). Together, these data indicate that the CD3/CD46-induced integrin pattern allows complement-induced Tregs to recognize and bind to MAdCAM-1 present on cells. Analysis of the adherence properties of CD3/CD46-activated T cells mediated by the α4β7/MAdCAM-1 interaction using a parallel plate flow chamber assay. A, Microscopic comparison of adherence behavior between differently activated PBL and freshly isolated LPL. CD3- or CD3/CD46-activated CD4+ PBL or nonactivated LPL were CSFE-labeled, injected into the flow chamber containing a monolayer of HeLa cells, and incubated for 15 min before the start of flow. Time-lapse microscopy was used to record DIC and fluorescent images of adherent T cells as the flow rate of the medium was increased. Representative DIC/CFSE-merged images are shown for indicated wall shear stress levels. Bar, 150 μm. 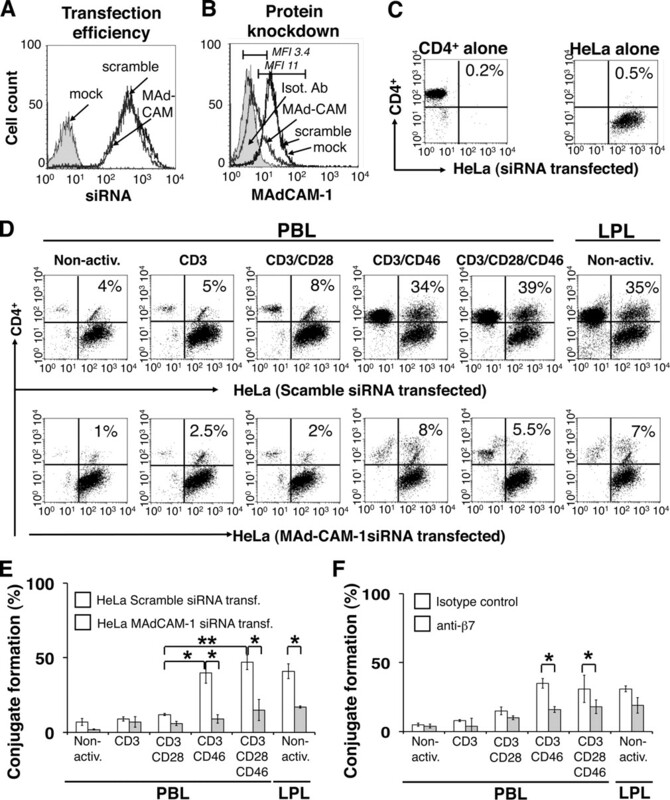 B, CD3/CD46-activated T cells adhere strongly to HeLa cells and this interaction is significantly decreased by preincubation with an anti-β7 Ab. Experiments were performed as described in A. At depicted wall shear stress levels, the number of adherent cells was assessed. Shown is the statistical analysis of β7-mediated blocking of the PBL-HeLa interaction of three separate experiments (mean ± SD). ∗, Statistical difference in adherence between CD3- and CD3/CD46-activated T cells and between cell populations with and without Ab addition was p < 0.05 in all cases as determined by ANOVA using the Student-Newman-Keuls post hoc test. C, LPL display similar adherence behavior as CD3/CD46-activated T cells. Experiments were performed as described in A and the number of adherent LPL plotted against the wall shear stress was as described in B. Shown is the result of one experiment. D, siRNA knockdown of MAdCAM-1 expression in HeLa cells abrogates adherence of CD3/CD46-activated T cells. HeLa cells were transfected with either control scramble siRNA or MAdCAM-1 siRNA. Flow experiments were then performed as described in A using CD3- or CD3/CD46-activated T cells and analyzed as described in B. Shown is the result of one experiment. Nonactivated T cells show weak initial binding to HeLa cells and detached almost completely upon flow initiation (Fig. 4⇑, A and B). In contrast, CD3/CD46-activated PBL display a strong interaction with HeLa cells and most of the cells (66 ± 11%) remain attached to the HeLa cell monolayer even under the highest wall shear stress condition analyzed (4.5 dyne/cm2). Despite all T cell populations being filtered through a cell strainer before injection into the chamber, within the initial 15 min of incubation with the HeLa cells, CD3/CD46-activated T cells reformed typical homotypic clusters that are observed during their activation in vitro (Fig. 4⇑A, panels in the second row). The analysis of a movie, generated from single exposures during the initial incubation period, showed that single CD3/CD46-activated T cells settle onto the HeLa cells and then move toward each other to form these characteristic cell clusters. The chemokine-chemokine receptor interaction mediating this migratory behavior of CD3/CD46-activated T cells is currently under investigation. We next analyzed the effect of a β7-blocking Ab on the interaction between CD3/CD46-activated T cells and HeLa cells in this dynamic system. Preincubation of CD3/CD46-induced Tregs with a blocking Ab to β7 decreased their initial binding to HeLa cells by ∼40% (±2%) and only ∼23% (±4%) remained attached under the highest flow conditions analyzed (Fig. 4⇑, A and B). CD3-activated PBL also displayed relatively substantial binding to HeLa cells; however, 41 ± 13% of cells detached immediately after flow was applied and only 23 ± 5% of the initially injected PBL were bound to the HeLa cells under the highest wall shear stress conditions. Preincubation of CD3-activated PBL with anti-β7 almost completely abrogated their binding to HeLa cells to a level exhibited by nonactivated PBL. As expected, freshly isolated nonactivated LPL also interacted strongly with HeLa in the parallel plate flow chamber assay and displayed adherence behavior similar to that of CD3/CD46-activated PBL (Fig. 4⇑, A and C). The addition of anti-β7 abrogated the interaction of LPL with HeLa cells (Fig. 4⇑, A and C). This is in contrast to static conjugate experiments in which the addition of anti-β7 during the LPL/HeLa incubation showed only 35% (±20%) binding inhibition (Fig. 3⇑E). Similarly, the addition of anti-β7 had also a greater effect on the CD3/CD46 Treg/HeLa interaction under physiological flow conditions since binding was inhibited by ∼78% vs the static experiments, where only 50% (±9%) of the binding was inhibited. We also performed the flow experiments using the HeLa cells in which MAd-CAM-1 expression had been silenced. As expected, the lack of MAd-CAM-1 abrogated the adherence and rolling of CD3/CD46-activated PBL on HeLa cells under physiological conditions almost completely (Fig. 4⇑D) and is in good agreement with the results obtained during the conjugate formation experiments (Fig. 3⇑). These data demonstrate that CD3/CD46-induced expression of α4β7 on primary peripheral blood T cells allows these cells to adhere and aggregate to cells that express the α4β7 receptor MAdCAM-1 and role over them under physiological flow conditions. The above results suggest that CD3/CD46 activation of peripheral blood T cells imprints these cells with properties that could facilitate their homing to or retention in the gut. To begin investigating a potential role for CD3/CD46-induced Tregs in the human small intestine, we determined whether the CD4+ T cell pool isolated from the LP contains cells with a cytokine profile characteristic of CD3/CD46-activated peripheral blood T cells. As we have shown previously that CD3/CD46-activated T cells also specifically express GM-CSF and soluble CD40 ligand (sCD40L) in addition to IL-10 (43), we analyzed LPL for the secretion of these three factors. Freshly isolated CD4+ LPL and PBL (Fig. 5⇓A) were each cultured in the presence of IL-2, but without any further TCR/costimulator stimulation and their spontaneous cytokine expression profile was measured via intracellular FACS staining after 24 h in culture (Fig. 5⇓B, upper three panel pairs). Although only few nonactivated PBL produce IL-10, sCD40L, and/or GM-CSF, ∼10% of the nonmanipulated LPL stain positive for the CD3/CD46 Treg signature cytokines. This LPL cell subpopulation did not express IL-4 or IL-5 (data not shown), a feature that discriminates them from Th2 effector T cells. The FACS analysis of CD3/CD46-activated PBL 24 h after activation is shown for comparison (Fig. 5⇓B, last panel pair). The number of cytokine-producing T cells in this control culture after 24 h is in agreement with previous studies (17, 43), with the percentage of PBL positive for these three cytokines after CD3/CD46 activation usually peaking at ∼50% at 72 h of activation (17). We also addressed whether LPL are still able to respond to CD3/CD46 activation and cultured these cells in the presence of immobilized mAbs to CD3 and CD46 and analyzed their cytokine secretion profile via ELISA. Although producing lower amounts of IL-10 and sCD40L compared with CD3/CD46-activated PBL, LPL respond to CD46 activation with increased production of all three analyzed cytokines (Fig. 5⇓C). Neither IL-4 not IL-5 was detected in these cultures and CD3 activation of PBL or LPL alone did not significantly increase cytokine production (data not shown). CD3/CD46-activated peripheral blood CD4+ T cells produce a cytokine pattern similar to that of LP-derived T cells. 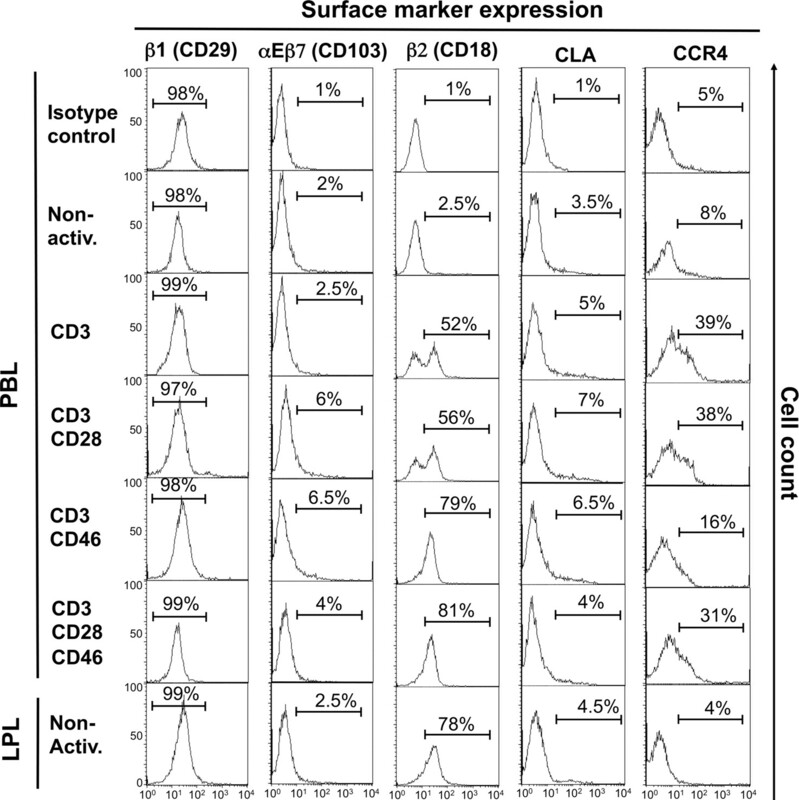 A, CD4+ T cells were isolated from blood or the LP and analyzed for purity via FACS analysis. B, Comparison of the simultaneous IL-10/CD40L and IL-10/GM-CSF production by resting and CD3/CD46-activated PBL with freshly isolated LPL. Purified PBL and LPL were cultured for 24 h in IL-2-containing medium in the presence of monensin (last 12 h of culture) and cytokine expression was determined by intracellular double staining and FACS analysis. CD3/CD46-activated PBL are shown for comparison. Depicted is one representative FACS analysis of three similarly performed experiments. C, LPL respond normally to CD3/CD46 activation. Freshly isolated PBL and LPL were cultured for 36 h without activation or with CD3/CD46 activation and cytokine production was measured by ELISA. Activation of PBL and LPL with an anti-CD3 Ab alone did not lead to a significant increase in cytokine production (data not shown). Statistical difference in cytokine production by differently activated PBL and LPL was determined using the paired Student t test with ∗, p < 0.05. In summary, in vitro CD3/CD46-activated CD4+ PBL acquire features similar to gut-resident/tropic T lymphocytes. Complementary, the human small intestinal LP contains T cells with key characteristics of CD3/CD46/complement-activated PBL. Because complement activation has been implicated in gut tissue destruction seen in IBD (44, 45), these data suggest the possibility that complement-induced Treg-mediated regulation of T cell responses could play a role in gut mucosal immunity and injury. CD46 is ubiquitously expressed and was originally identified as a complement regulator that functions as a cofactor in the factor I-mediated cleavage of the opsonins C3b and C4b, thereby protecting host cells/tissue from unwanted deposition of complement activation fragments (46). It is now clear, however, that CD46 serves additional important roles. For example, CD46 participates in sperm-egg interaction during fertilization (47) and functions as a costimulator during T cell activation (16, 48). Importantly, CD3/CD46 cross-linking on human CD4+ T lymphocytes induces intracellular signaling events that lead to T cell proliferation (16, 48) and IL-10 and granzyme B production (17, 20). Such CD3/CD46-activated T cells suppress the activation/function of bystander effector T cells through production of immunosuppressive IL-10 and simultaneous IL-2 consumption (cell-cell contact-independent mechanisms), as well as granzyme B/perforin-mediated target killing (cell-cell contact-dependent mechanisms) (17, 19, 20, 21). The ability to down-modulate T cell responses could be an explanation as to why many important human pathogens including measles and herpes virus as well as Streptococcus pyogenes and pathogenic Neisseria utilize CD46 as a cell-entry receptor (49). Supporting this idea is our observation that streptococci induce these regulative T cells via CD46 cross-linking, thereby generating a more conducive environment for an infection (18). An additional indication for a role of CD3/CD46-activated T cells in immune response regulation is the finding that multiple sclerosis patients present with defects in the CD46-induced IL-10 production of peripheral CD4+ T cells (50) and that a proportion of patients deficient in CD46 develop common variable immunodeficiency (51). However, when and how CD3/CD46-induced immunomodulatory T cells are induced in vivo and in what setting or tissue location the required conditions are met are critical and unanswered questions. A small animal model to examine this question in vivo is currently not available because rodents express CD46 only on spermatozoa (52). On mouse somatic cells, another protein, Crry, mediates complement regulation (53). Although human CD46 and mouse Crry are structurally related, activation of mouse naive CD4+ T cells through CD3/Crry does not lead to IL-10/granzyme B production (data not shown). In addition, CD4+ T cells isolated from human CD46-transgenic mice do not produce IL-10 or granzyme B upon activation with anti-mouse CD3 and anti-human CD46 Abs (data not shown). These results suggest that the receptor pathway inducing IL-10-secreting adaptive Tr1 cells in the mouse (14) has not been identified. Therefore, to determine in what tissue and under what conditions CD46-activated immunomodulatory T cells are induced in vivo, we turned our attention to human T cells and tissues. In this study, we demonstrate that CD3/CD46 activation of human CD4+ PBL induces the expression of gut-homing receptors, namely, the integrin α4β7, the surface-bound cytokine LIGHT, and the chemokine receptor CCR9. CD3/CD46-mediated expression of α4β7 equips these PBL to bind to cells expressing the receptor for α4β7 MAdCAM-1 under physiological flow conditions. 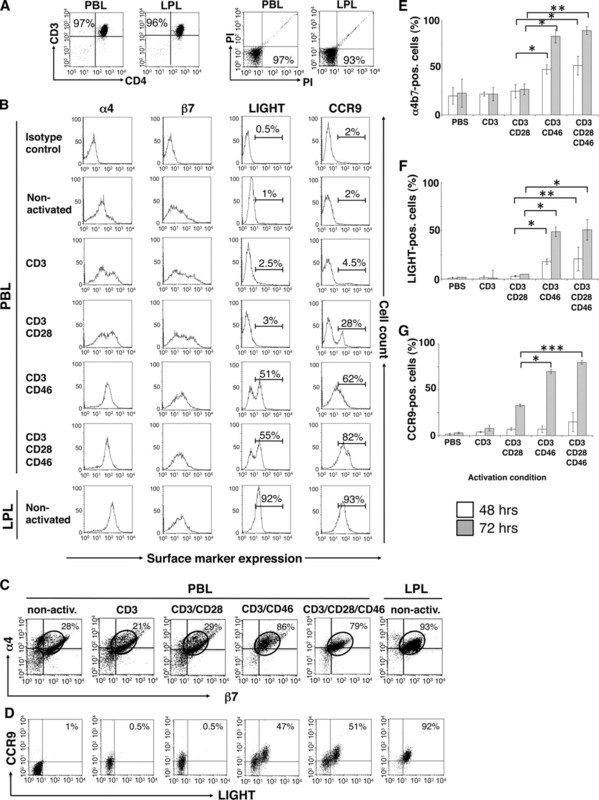 Thus, the activation of T cells in the presence of CD46-cross-linking ligands induces a lymphocyte population that may be retained in or home to the gut and therefore suggests a role for CD3/CD46-induced immunomodulatory T cells in intestinal immunity. A specific function for CD3/CD46-activated T cells in the gut is in agreement with the observation that adaptive Tr1 or IL-10-producing Tregs are relatively abundant in the intestine and that their absence permits onset of gut autoimmunity (54, 55, 56). Accordingly, IBD patients contain proportionally less IL-10-secreting Tregs in the LP as compared with healthy individuals (57) and altered regulation of the intestinal T cell populations can lead to the development of chronic intestinal inflammation (25, 58). In addition, a recent study aimed at delineating the specific role of Foxp3-expressing vs IL-10-producing Tregs in a mouse model suggests that IL-10 secreted by T cells is the key factor in the maintenance of tolerance at mucosal interfaces (28). Although CD3/CD46 cross-linking alone is sufficient to induce α4β7 and LIGHT up-regulation on PBL (Fig. 1⇑, B–F), CD46-driven induction of the gut-homing essential chemokine receptor CCR9 was dependent on the presence of RA in our in vitro system (Fig. 1⇑, B, D, and G). This suggests that induction of CD3/CD46-activated T cells likely occurs in the intestine or mesenteric lymph nodes, as opposed to peripheral lymph nodes, since RA is specifically produced by intestinal dendritic cells (DCs) (59). The intestinal immune system has to recognize and clear pathogens while simultaneously maintaining tolerance toward commensals. CD3/CD46-activated Tregs could play a role in regulating this balance between tolerogenic vs immunogenic T cell responses at this location. The normal gut flora creates a massive proinflammatory milieu and is a constant source of foreign Ag and complement activation, thus providing stimuli necessary for the induction of effector as well as CD3/CD46-activated immunomodulatory T cells (43). Indeed, both effector and IL-10-secreting Tregs specific for the same enteric Escherichia coli-derived Ag have been identified in the intestine (54). Sampling and presentation of such E. coli Ags by local DCs is constitutive and activates Ag-specific (memory) effector T cells. This activation in turn would provide the necessary IL-2 to stimulate Ag-specific CD46-induced (memory) Tregs, which could suppress unwanted effector responses through IL-10 secretion in a contact-independent manner (54, 58). CD3/CD46-activated T cells may also uniquely participate in mucosal immune homeostasis since CD3/CD46-induced immunomodulatory T cells impact DC maturation/function quite distinctively. In contrast to other adaptive Treg populations, the cytokine profile secreted by CD46-induced Tregs permits DC activation through the simultaneous secretion of GM-CSF and sCD40L in addition to their IL-10 production (which usually inhibits DC maturation) (43). However, CD46-induced adaptive Tregs express high amounts of granzyme B and can kill DCs upon cell-cell contact (20, 21). Thus, CD3/CD46-activated Tregs, specific for Ags derived from nondangerous enteric bacteria, might kill APCs presenting the same innocuous Ag upon cell contact and thereby prevent the induction of unnecessary responses. Thus, CD46-induced Tregs could support mucosal tolerance at the T cell and DC level. In contrast, immature DCs encountering invading pathogens should not interact with/get killed by resident Tr1-like cells because these Ags are not recognized by the CD46-induced Treg pool. Therefore, these DCs can mature in the presence of CD3/CD46-induced granzyme B/IL-10/GM-CSF/sCD40L-producing Tregs. Activated DCs could then migrate to the draining lymphoid tissues and initiate an immune response. Thus, CD3/CD46-activated “DC-sparing” Tregs would be desirable in the gut because their cytokine/granzyme profile may provide a mechanism for ensuring unresponsiveness to commensals and innocuous Ags (by suppressing an unwanted effector T cell response through IL-10 and killing DCs presenting commensal Ags) while maintaining reactivity to invading pathogens (by allowing for DC maturation upon encounter with pathogenic Ags). Although there is accumulating indication for a potential role of CD3/CD46-induced Tregs in the intestine, our in vitro-derived data still await in vivo validation. In accordance with the above developed model for the potential induction/function of CD3/CD46-activated T cells, our initial ex vivo experiments suggest that the human small intestinal LP contains T cells with characteristics of CD46/complement-activated PBL (Fig. 5⇑). We are currently trying to expand this LPL subpopulation to analyze these cells for their potential suppressive properties toward effector T cells. However, the finding that a proportion of LP-resident T cells produces a cytokine profile similar to that of CD46-induced Tregs is at this point circumstantial and does not allow us to conclude that these cells have indeed been induced via previous CD46 engagement. Such a notion would require the expression of a specific CD46 Treg marker; however, as it is the case for other adaptive IL-10-secreting Treg populations (9), such a marker remains to be identified. In summary, the data presented here suggest a role for complement-induced immunomodulatory T cells in intestinal immunity. Since the complement system preceded the evolution of T and B lymphocytes, it is not surprising that features of this ancient arm of innate immunity are an integral part in the regulation of adaptive immune responses, specifically at the host/environment interface. We thank Drs. John Atkinson, Dennis Hourcade, and Anja Fuchs for insightful discussion of the results and critical reading of this manuscript. ↵1 This work was supported in part by grants from the Sandler Program for Asthma Research and National Institutes of Health Grants U19 AI070489, R01 DK33165, and R01 DK55753. ↵3 Abbreviations used in this paper: Treg, T regulatory cell; IBD, inflammatory bowel disease; LP, lamina propria; MAdCAM-1, mucosal addressin cell adhesion molecule 1; LPL, LP-resident lymphocyte; siRNA, small interfering RNA; DIC, differential interference contrast; RA, retinoic acid; DC, dendritic cell; sCD40L, soluble CD40 ligand. Van Parijs, A., A. K. Abbas. 1998. Homeostasis and self-tolerance in the immune system: turning lymphocytes off. Science 280: 243-248. Bluestone, J. A., A. K. Abbas. 2003. Natural versus adaptive regulatory T-cells. Nat. Rev. Immunol. 3: 253-257. Sakaguchi, S.. 2000. Regulatory T-cells: key controllers of immunologic self-tolerance. Cell 101: 455-458. Shevach, E. M.. 2000. Regulatory T-cells in autoimmunity. Annu. Rev. Immunol. 18: 423-449. Jonuleit, H., E. Schmitt. 2003. The regulatory T-cell family: distinct subsets and their interrelations. J. Immunol. 171: 6323-6327. Chen, W., W. Jin, N. Hardegen, K. Lei, L. Li, N. Marinos, G. McGrady, S. M. Wahl. 2003. Conversion of peripheral CD4+CD25− naive T-cells to CD4+CD25+ regulatory T-cells by TGF-β induction of transcription factor Foxp3. J. Exp. Med. 198: 1875-1886. Roncarolo, M. G., R. Bacchetta, C. Bordignon, S. Narula, M. K. Levings. 2001. Type 1 regulatory cells. Immunol. Rev. 182: 68-79. Vieira, P., J. R. Christensen, S. Minaee, E. J. O'Neill, F. J. Barrat, A. Boonstra, T. Barthlott, B. Stockinger, D. C. Wraith, A. O'Garra. 2004. IL-10 secreting regulatory cells do not express Foxp3 but have comparable regulatory function to naturally occurring CD4+CD25+ regulatory T cells. J. Immunol. 172: 5986-5993. Fehérvari, Z., S. Sakaguchi. 2004. Development of CD25+CD4+ regulatory T-cells. Curr. Opin. Immunol. 16: 203-208. Ramsdell, F.. 2003. Foxp3 and natural regulatory T-cells: key to a cell lineage?. Immunity 19: 165-168. Fukaura, H., S. C. Kent, M. J. Pietrusewicz, S. J. Khoury, H. L. Weiner, D. A. Hafler. 1996. Induction of circulating myelin basic protein and proteolipid protein-specific transforming growth factor-β1-secreting Th3 T-cells by oral administration of myelin in multiple sclerosis patients. J. Clin. Invest. 98: 70-77. Chen, Y., V. K. Kuchroo, J. Inobe, D. A. Hafler, H. L. Weiner. 1994. Regulatory T-cell clones induced by oral tolerance: suppression of autoimmune encephalomyelitis. Science 265: 1237-1240. Groux, H., A. O'Garra, M. Bigler, S. Antonenko, J. E. de Vries, M. G. Roncarolo. 1997. A CD4+ T-cell subset inhibits antigen-specific T-cell responses and prevents colitis. Nature 389: 737-742. Stock, P., O. Akbari, G. Berry, G. J. Freeman, R. H. Dekruyff, D. T. Umetsu. 2004. Induction of T helper type 1-like regulatory cells that express Foxp3 and protect against airway hyper-reactivity. Nat. Immunol. 5: 1149-1156. Astier, A., M.-C. Trescol-Biemont, O. Azocar, B. Lamouille, C. Rabourdin-Combe. 2000. Cutting edge: CD46, a new costimulatory molecule for T cells that induces p120CBL and LAT phosphorylation. J. Immunol. 164: 6091-6095. Kemper, C., A. C. Chan, J. M. Green, K. A. Brett, K. M. Murphy, J. P. Atkinson. 2003. Activation of human CD4+ cells with CD3 and CD46 induces a T-regulatory cell 1 phenotype. Nature 421: 388-392. Kemper, C., J. P. Atkinson. 2007. T-cell regulation: with complements from innate immunity. Nat. Rev. Immunol. 7: 9-18. Grossman, W. J., J. W. Verbsky, B. L. Tollefsen, C. Kemper, J. P. Atkinson, T. J. Ley. 2004. Differential expression of granzymes A and B in human cytotoxic lymphocyte subsets and T regulatory cells. Blood 104: 2840-2848. Grossman, W. J., J. W. Verbsky, W. Barchet, M. Colonna, J. P. Atkinson, T. J. Ley. 2004. Human T regulatory cells can use the perforin pathway to cause autologous target T-cell death. Immunity 21: 689-601. Kuhn, R., J. Lohler, D. Rennick, K. Rajewski, W. Muller. 1993. Interleukin-10-deficient mice develop chronic enterocolitis. Cell 75: 263-274. Sadlack, B., H. Merz, H. Schorle, A. Schimpl, A. C. Feller, I. Horak. 1993. Ulcerative colitis-like disease in mice with a disrupted interleukin-2 gene. Cell 75: 253-261. Asseman, C., F. Powrie. 1998. Interleukin 10 is a growth factor for a population of regulatory T-cells. Gut 42: 157-158. Asseman, C., S. Mauze, M. W. Leach, R. L. Coffman, F. Powrie. 1997. An essential role for interleukin-10 in the function of regulatory T-cells that inhibit intestinal inflammation. J. Exp. Med. 190: 995-1004. Sakaguchi, S., N. Sakaguchi. 2005. Regulatory T-cells in immunologic self-tolerance and autoimmune disease. Intern. Rev. Immunol. 24: 211-226. O'Garra, A., P. Vieira. 2004. Regulatory T-cells and mechanisms of immune system control. Nat. Med. 10: 801-805. Yuri, P., P. Rubtsov, J. P. Rasmussen, E. Y. Chi, J. Fontenot, L. Castelli, X. Ye, P. Treuting, L. Siewe, A. Roers, et al 2008. Regulatory T cell-derived interleukin-10 limits inflammation at environmental interfaces. Immunity 28: 546-558. Kantele, A., J. Zivny, M. Hakkinen, C. O. Elson, J. Mesteckey. 1999. Differential homing commitments of antigen-specific T cells after oral or parental immunization in humans. J. Immunol. 162: 5173-5177. Johansson-Lindbom, B., W. W. Agace. 2007. Generation of gut-homing T-cells and their localization to the small intestinal mucosa. Immunol. Rev. 215: 226-242. Mora, J. R., U. H. von Andrian. 2006. T-cell homing specificity and plasticity: new concepts and future challenges. Trends Immunol. 27: 235-243. Hamann, A., D. P. Andrew, D. Jablonski-Westrich, B. Hilzmann, E. C. Butcher. 1994. Role of α4 integrins in lymphocyte homing to mucosal tissues in vivo. J. Immunol. 152: 3282-3293. Svensson, M., J. Marsal, A. Ericsson, L. Carramolino, T. Brodén, G. Márquez, W. W. Agace. 2002. CCL25 mediates the localization of recently activated CD8αβ+ lymphocytes to the small-intestinal mucosa. J. Clin. Invest. 110: 1113-1121. Mauri, D. N., R. Ebner, R. I. Montgomery, K. D. Kochel, T. C. Cheung, G.-L. Yu, S. Ruben, M. Murphy, R. J. Eisenberg, G. H. Cohen, et al 1998. LIGHT, a new member of the TNF superfamily, and lymphotoxin α are ligands for herpesvirus entry mediator. Immunity 8: 21-30. Cohavy, O., J. Zhou, C. F. Ware, S. R. Targan. 2005. LIGHT is constitutively expressed on T and NK cells in the human gut and can be induced by CD2-mediated signaling. J. Immunol. 174: 646-653. Zabel, B. A., W. W. Agace, J. J. Campbell, et al 1999. Human G protein-coupled receptor GPR-9-6/CC chemokine receptor 9 is selectively expressed on intestinal homing T lymphocytes, mucosal lymphocytes, and thymocytes and is required for thymus-expressed chemokine-mediated chemotaxis. J. Exp. Med. 190: 1241-1256. Kunkel, E. J., J. J. Campbell, G. Haraldsen, J. Pan, J. Boisvert, A. I. Roberts, E. C. Ebert, M. A. Vierra, S. B. Goodman, M. C. Genovese, et al 2000. Lymphocyte CC chemokine receptor 9 and epithelial thymus-expressed chemokine (TECK) expression distinguish the small intestinal immune compartment: epithelial expression of tissue-specific chemokines as an organizing principle in regional immunity. J. Exp. Med. 192: 761-768. James, S. P., C. Fiocchi, A. S. Graeff, W. Strober. 1986. Phenotypic analysis of lamina propria lymphocytes: predominance of helper-inducer and cytolytic T-cell phenotypes and deficiency of suppressor-inducer phenotypes in Crohn’s disease and control patients. Gastroenterology 91: 1483-1489. Iwata, M., A. Hirakiyama, Y. Eshima, H. Kagechika, C. Kato, S.-Y. Song. 2004. Retinoic acid imprints gut-homing specificity on T-cells. Immunity 21: 527-538. Butcher, E. C., M. Williams, K. Youngman, L. Rott, M. Briskin. 1999. Lymphocyte trafficking and regional immunity. Adv. Immunol. 72: 209-253. Papadakis, K. A., J. Prehn, V. Nelson, L. Cheng, S. W. Binder, P. D. Ponath, D. P. Andrew, S. R. Targan. 2000. The role of thymus-expressed chemokine and its receptor CCR9 on lymphocytes in the regional specialization of the mucosal immune system. J. Immunol. 165: 5069-5076. Berlin, C., R. F. Bargatze, U. H. Campbell, U. H. von Andrian, M. C. Szabo, S. R. Hasslen, R. D. Nelson, E. L. Berg, S. L. Erlandsen, E. C. Butcher. 1995. α4 Integrins mediate lymphocyte attachment and rolling under physiologic flow. Cell 80: 413-422. Barchet, W., J. D. Price, M. Cella, M. Colonna, S. K. MacMillan, J. P. Cobb, K. M. Murphy, J. P. Atkinson, C. Kemper. 2006. Complement-induced regulatory T-cells suppress T-cell responses but allow for dendritic cell activation. Blood 107: 1497-1504. Kolios, G., C. Petoumenos, A. Nakos. 1998. Mediators of inflammation: production and implication in inflammatory bowel disease. Hepatogastroenterology 45: 1601-1609. Ueki, T., M. Mizuno, T. Uesu, T. Kiso, J. Nasu, T. Inaba, Y. Kihara, Y. Matsuoka, H. Okada, T. Fujita, T. Tsuji. 1996. Distribution of activated complement, C3b, and its degradation fragments, iC3b/C3dg, in the colonic mucosa of ulcerative colitis (UC). Clin. Exp. Immunol. 104: 286-292. Liszewski, M. K., M. Leung, W. Cui, W. B. Subramanian, J. Parkinson, P. N. Barlow, M. Manchester, J. P. Atkinson. 2001. Dissecting sites important for complement regulatory activity in membrane cofactor protein (MCP; CD46). J. Biol. Chem. 275: 37692-33770. Riley-Vargas, R. C., D. B. Gill, C. Kemper, M. K. Liszewski, J. P. Atkinson. 2004. CD46: expanding beyond complement regulation. Trends Immunol. 25: 496-503. Zaffran, Y., O. Destaing, A. Roux, S. Ory, T. Nheu, P. Jurdic, C. Rabourdin-Combe, A. L. Astier. 2001. CD46/CD3 costimulation induces morphological changes of human T cells and activation of Vav, Rac, and extracellular signal-regulated kinase mitogen-activated protein kinase. J. Immunol. 167: 6780-6785. Cattaneo, R.. 2004. Four viruses, two bacteria, and one receptor: membrane cofactorprotein (CD46) as pathogens’ magnet. J. Virol. 78: 4385-4388. Astier, A., G. Meiffren, S. Freeman, D. A. Hafler. 2006. Alterations in CD46-mediated Tr1 regulatory T-cells in patients with multiple sclerosis. J. Clin. Invest. 12: 3252-3257. Kavanagh, D., A. Richards, V. Fremeaux-Bacchi, M. Noris, T. Goodship, G. Remuzzi, J. P. Atkinson. 2007. Screening for complement system abnormalities in patients with atypical hemolytic uremic syndrome. Clin. J. Am. Soc. Nephr. 2: 591-596. Seya, T., T. Hara, M. Matsumoto. 1993. Membrane cofactor protein (MCP, CD46) in seminal plasma and on spermatozoa in normal and “sterile” subjects. Eur. J. Immunol. 23: 1322-1327. Cong, Y., C. T. Weaver, A. Lazenby, C. O. Elson. 2002. Bacterial-reactive T regulatory cells inhibit pathogenic immune responses to enteric flora. J. Immunol. 169: 6112-6119. Khoo, U. Y., I. E. Proctor, A. J. McPherson. 1997. CD4+ T cell down-regulation in human intestinal mucosa: evidence for intestinal tolerance to luminal bacterial antigens. J. Immunol. 158: 3626-3634. Braunstein, J., L. Qiao, F. Autschbach, G. Schurmann, S. Meuer. 1997. T-cells of the human intestinal lamina propria are high producers of interleukin-10. Gut 41: 215-220. Ten Hove, T.. 2004. Expression of CD45RB functionally distinguishes intestinal T-lymphocytes in inflammatory bowel disease. J. Leukocyte Biol. 5: 1010-1015. Duchmann, R., M. F. Neurath, K. H. Meyer zum Buschenfelde. 1997. Responses to self and non-self intestinal microflora in health and inflammatory bowel disease. Res. Immunol. 148: 589-594. Johansson-Lindbom, B., M. Svensson, O. Pabst, C. Palmqvist, G. Marquez, R. Förster, W. W. Agace. 2005. Functional specialization of gut CD103+ dendritic cells in the regulation of tissue-selective T-cells homing. J. Exp. Med. 202: 1051-1061.